You run your own business. You are the boss. Whether you have employees, or ride solo, you wear many hats. You want to market your company but where do you start? How do you possibly become successful at managing Facebook, Instagram, and LinkedIn all at the same time? Maybe you’ve never even really figured out how to use these platforms as marketing resources. What is a hashtag and why do you keep seeing “follow us on Facebook!” everywhere you go? Maybe you’re already a social media manager, but could use a little bit of help when it comes to content. Have no fear! Germono Advertising Company is here! 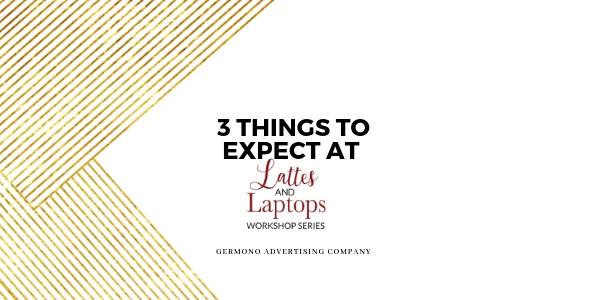 We have created our workshop series just for you: Lattes and Laptops. Spoiler alert: we serve fresh hot coffee and snacks. When you attend a Lattes and Laptops workshop, we break down the main social media platforms and teach you the do’s and don’ts of posting online. We start with the basics about different social media platforms. We show you how to use each platform, discuss what content to post, and reveal the best practices for marketing your company online. This means you receive one whole hour of professional marketing training from one of our Marketing Coaches! Don’t worry, this isn’t your typical ho-hum presentation. We keep the momentum going with trivia, and of course – the free coffee and snacks. Sample social media content calendar. Ever get stuck on what to post? Feel like there’s just not enough time in the day to come up with verbiage or ideas of what to post? If you answered yes to any of those questions, our social media content calendar will have you thanking us later. Networking. Since this is an event for local businesses and marketing managers, you get to listen and learn with like-minded individuals. Networking has its perks. It increases business and the generation of referrals. On average, we have about 12 individuals that attend each workshops. We cap the number of attendees so everyone can participate and have a one-on-one conversation with our Marketing Coach. With a motivated group of business owners comes an abundance of opportunities! You didn’t think we’d give all of our trade secrets away, did you? If you are interested in signing up for one of our upcoming workshops, click here to see when our next scheduled event is! Ticket price includes training session, workshop materials, 30 day sample social media content suggestions, and refreshments. See you there! Oh and don’t forget your laptop! Can’t make a workshop and need help NOW? Email info@germono.com or call 757-777-3780 to set up a complimentary 30 minute consultation!